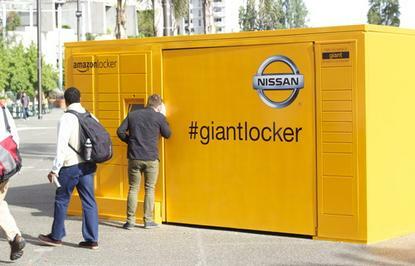 Amazon's large locker in San Francisco is part of an ad campaign with Nissan. A mysterious, massive Amazon locker in San Francisco is not filled with drones, but is part of a marketing campaign with Nissan. The locker, which is named "Giant," was spotted on Thursday last week in front of San Francisco's iconic Ferry Building. Amazon initially did not respond to questions about its purpose. Since then, however, a large Nissan logo was slapped onto the structure, along with the hashtag #giantlocker printed on one of its walls. Amazon and Nissan then said Friday that it was part of a marketing promotion between the e-commerce company and the Japanese car maker. The companies are encouraging passersby on Friday to comment and post photos of locker using the hashtag. Those who do will earn a code to open the doors on the locker to win a variety of prizes, including Amazon music downloads. "One lucky participant will get the surprise of a lifetime when his/her code opens the giant door, and s/he wins a new Nissan Rogue," a Nissan spokeswoman said. The bright orange locker -- which is 16 feet wide, 20 feet deep and 8 feet high -- was attracting the attention of a number of people Friday morning. Cars can be purchased on Amazon.com, but typically they must be picked up from a local dealership. Amazon and Nissan teamed up last year to have a Nissan Versa Note car delivered inside a huge Amazon box. But that box was different from the high-tech locker currently in San Francisco, which features an LCD screen and keypad. Amazon operates a locker service, which lets shoppers have their items shipped to various locations around town instead of their homes. The lockers are much smaller than the structure near San Francisco's Ferry Building and are located inside stores such as 7-Eleven and Ace Hardware. So Amazon's Giant locker, for better or worse, does not seem to be a company push toward larger pick-up centers in public settings.